Sound "Nobody will accuse the S8s of sounding tipped up, grainy or harsh. Their sound is sweetly detailed. They convey transient snap and spatial cues as well as any speakers I've heard, yet they are also full and pleasing." Bass "depth and dexterity were immediately obvious, and its weight lends a sense of bloom that is quickly irresistible." Above all, the S8s "push you to transcend the act of listening to an audio system in order to enjoy the act of experiencing music." from the ground up, including brand-new drivers and crossovers."
. Firing the speakers so their output summed at my listening position, which meant pointing them directly at my seat...worked perfectly, the speakers conveying high frequencies in a very complete, natural way." Value "All of these elements -- cabinet, drivers and crossover -- make up a speaker that looks on paper and in person like one whose cost is comfortably in the five-figure range. Yet, the Signature S8, Paradigm's flagship, costs $5400 USD per pair in cherry finish, $6000 per pair in rosewood, birds-eye maple or piano-black finishes." Loudspeakers represent one of the most abundant segments of the consumer-electronics market, with not only a great number of companies making speakers but all of them offering several models, some aimed at two-channel audiophiles and many others created for home-theater use. These two concerns are not mutually exclusive, however. A good loudspeaker is a good loudspeaker, period. What it will reproduce, music versus dialog and explosions, should have no bearing on how it is designed. The best speaker companies know this and create transducers that not only have musical chops but are also shielded for use on movie night. Such is the case with the various speakers from Paradigm, which range in price from less than $200 USD per pair to over $5000 per pair -- with many increments in between. Somehow I've reviewed audio equipment for over eight years and never written about (or listened extensively to) a Paradigm speaker, so I feel fortunate to start with the largest floorstander in Paradigm's new Signature line, the S8. I'll leave it to the writers at our Home Theater & Sound site to discuss how the Signature speakers do with movies. With music, amidst a sea of loudspeakers, the S8 is a beacon, a speaker you need to hear if you're in the market for a long-term reference. Details follow. Paradigm is one of the largest high-end-audio companies in the world. Yes, there are Far East electronics giants that dwarf it, but Paradigm's emphasis is on high-end audio and home theater, not mass-market products. Even so, no one can accuse Paradigm of making only pricey products. Indeed, speakers like the Atom cost less than the competition at Best Buy but are just as thoughtfully engineered as Paradigm's more expensive speakers like the Signature S8. That's what happens at engineering-driven companies: the culture demands that all products be designed the same way. It's especially noteworthy, then, when a company like Paradigm decides to focus its efforts on creating a product that's better than any other it has made. Consumers start to anticipate the outcome when such a company flexes its engineering muscle. I'm reminded of comic books in which superheroes team up to fight a particularly troublesome foe. When Spiderman joins forces with the Hulk, evil-doers had better watch out. This is also the perception of an all-out effort from Paradigm -- speaker buyers had better take notice. Depending on your perspective, Paradigm either took its time or dragged its heels with its new Signature line. We saw and photographed the S2, S4 and S8 over the course of almost two years, and in each case the speakers certainly looked finished. In fact, the appearance of the speakers didn't change over that time, but given that Paradigm designed the Signature line from the ground up, including brand-new drivers and crossovers, I'm sure that the company had a number of wrinkles to work out before the speakers could make their way to dealer showrooms. Whatever the case may be, the Signature speakers look gorgeous. Their slim, stout cabinets gently taper from front to back -- the lack of parallel surfaces minimizes internal resonance. The combination of striking real-wood veneers and a high-gloss finish makes for a speaker that looks like fine furniture. There are many elements responsible for the Signature line, but chief among these are the brand-new drivers, which Paradigm designed and manufactures in its 115,000-square-foot Mississauga, Ontario facility. The 1" G-PAL tweeter, for instance, is a technical tour de force. Among its innovations is a light, rigid gold-anodized aluminum dome that's slightly elevated to ensure optimum off-axis dispersion, a fundamental goal of speaker design at Paradigm. Its chassis, including the front plate, is completely die-cast to eliminate mechanical anomalies, and it uses a pair of 20,000-gauss "Super Neodymium" magnets for lower distortion and greater power handling. The 7" Signature midrange uses a new version of Paradigm's mica-loaded polymer (MLP) cone along with a Nomex suspension and butyl-rubber surround, which all reportedly contribute to a freedom from resonance and distortion. The S8's woofer is the same diameter as the midrange and uses a mineral-filled polypropylene cone that has a greater stiffness-to-mass ratio and allows for higher power handling. I won't address the massive 15" driver in the Signature Servo subwoofer except to say that it's obviously made for very high excursion and power handling. All drivers utilize what Paradigm calls IMS Shock-Mount, which is a way of decoupling the drivers from the cabinet baffle with gaskets and isolation inserts to minimize driver/cabinet interaction. Signature crossovers are a combination of second- and third-order slopes, which Paradigm uses to "ensure the highest precision signal transfer to the drivers." Internal wiring is silver-plated oxygen-free copper that's spiraled, which is said to reduce inductive distortion. Crossover parts are said to be of very high quality and selected by hand to maintain close tolerances. All of these elements -- cabinet, drivers and crossover -- make up a speaker that looks on paper and in person like one whose cost is comfortably in the five-figure range. Yet, the Signature S8, Paradigm's flagship, costs $5400 USD per pair in cherry finish, $6000 per pair in rosewood, birds-eye maple or piano-black finishes. The review speakers came in birds-eye maple, which looks terrific -- very glossy and grainy. I've seen the S8 in rosewood, and it looks even more dramatic. The Signature S8 measures 48 1/2"H x 8 1/2"W x 20 1/2"D and weighs 100 pounds. It's a three-way, six-driver affair (tweeter, midrange and four woofers, all magnetically shielded) with front and rear ports and crossover points at 1800Hz and 250Hz. Sensitivity is quoted as 88dB in an anechoic chamber, 91dB in your listening room. Suitable power range is 15 to 500 watts. On-axis frequency response is 41Hz-22kHz, with a 28Hz DIN 45 500 limit. DIN 45 500 is a standardized way of expressing low-frequency extension and gives an indication of what nominal room gain would add to the output. In Paradigm's case, it is roughly applicable to the -10dB anechoic point. As has been the case recently, I used the Paradigm Signature S8s with a wide array of electronics and cables. Amplifiers included Lamm M1.2 Reference and ML2.1 monoblocks, Atma-Sphere MA-2 Mk II.3 monoblocks, Simaudio W-6 monoblocks, and a Belles 150A Reference stereo unit. Preamps were a Lamm L2 Reference, Atma-Sphere MP-1 Mk II, Belles 21A with Auricap upgrade and Classé DP-500. Digital equipment included Esoteric DV-50, X-01 and UX-1 multi-format players, and a Mark Levinson No.37 transport tethered to a Zanden Model 5000 Mk III DAC via i2Digital X-60 or Audience Au24 BNC-terminated digital cables. Interconnects and speaker cables were Siltech Signature G6 Forbes Lake and Eskay Creek, Acoustic Zen Silver Reference II and Hologram II, DH Labs Revelation and Q-10, and Nordost Valhalla. Power cords were from Shunyata Research (Anaconda Vx, Anaconda Alpha and Taipan) and Siltech (Signature G6 Ruby Hill), with a Shunyata Research Hydra Model-8 providing power to all components. Electronics rested on either Silent Running VR 3.0 isoBases, a pair of Michael Green Designs racks, or various products from Harmonic Resolution Systems, including the M3 isolation base. Speakers on hand were Wilson Audio MAXX Series 2s and WATT/Puppy 7s, along with Thiel CS2.4s. In one way or another, I used all of these speakers for comparison, even the Wilson speakers, which cost several times the Signature S8s' price. For direct comparison, however, I stuck to the Thiel CS2.4s because they are closer in price to the Paradigms and therefore a more natural competitor. The folks at Paradigm believe in speaker break-in -- they've measured its effects. However, their research shows that it happens in very little time, a couple of hours tops instead of the hundreds that other speaker manufacturers quote. Therefore, for good measure, I played the Signature S8s for four hours before sitting down to do any tweaking of placement or close listening. While listening casually off-axis and with the speakers not sited optimally, I heard an obvious rightness that I can't say improved after a few hours of play but certainly was not hurt. I eventually placed the speakers slightly closer together than the Wilson Audio MAXX 2s (100") and about the same distance from the front wall (50"). Once properly positioned, the Signature S8s cast a three-dimensional soundstage that migrated beyond the speaker positions. This aspect of their sound reminded me of the various Merlin VSMs I've heard, which disappear and leave behind music in their place. It is difficult to describe just how good the S8s are -- they impart very little of their own sound to recordings, yet remain "musical" and totally composed no matter the situation. About the only thing that they can't do is reproduce extreme low bass. They played very solidly into the 30Hz range in my system while maintaining a clarity and articulation in the bass and exhibiting almost no audible distortion. The S8s were able to reproduce frequencies down into the 20Hz range, but their output was noticeably reduced. Although there are speakers that will go deeper than the S8s, typically most of them at anywhere near the S8's price will sound somewhat boomy in comparison. In fact, the S8s performance from around 40Hz and throughout the rest of the frequency spectrum is absolutely impeccable. The S8s do not require a massive amplifier with huge amounts of power to achieve this excellent sound. The colossal 325Wpc Anthem Statement P5 did produce incredible dynamics and rock-solid imaging with the S8s, but the Bel Canto eVo6, rated at only 120Wpc, provided nearly the same level of control and could play as loud as I could stand. Even at very high levels, the S8s' huge soundstage was coherent and uniform between the speakers and even slightly outside them. On "After the Gold Rush" from k.d. langs Hymns from the 49th Parallel [Nonesuch 2 79847], piano and strings were full-bodied and filled the entire soundstage, while the bass was placed just to the right of center . Lang's voice was commanding, yet it sounded natural and unforced and was placed precisely at the center of the soundstage. There was some sibilance in the vocals, but the S8s presented the recording as it was rather than draw undue attention to flaws. Truly great recordings such as Holly Coles Shade [Alert 6152810392] sounded, well, great. The kickdrum is not recorded at a particularly high level on "Heat Wave," but it was extremely taut and punchy, while percussion was detailed and realistic. The differences between various types of drums, bongos and other percussion instruments were immediately apparent, and Coles vocals were simply spectacular. 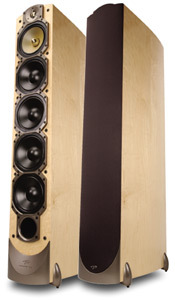 The Paradigm Signature S8s are very special speakers. After listening to their incredible performance and examining their high-quality finish and rock-solid construction, I would have guessed that they cost much more than they do. Reviewers often say how a product redefines performance at a particular price point, but in the case of the S8s they would be correct. The Signature S8s provide performance and build quality in the same general class as many of the more expensive prestige speakers, but at a price that's within reach. Toe-in is of special importance, however. Listening with the S8s pointed straight ahead, which puts you off-axis, makes for sound that's soft and impressionistic, with too little high-frequency information. Removing the grilles is an option, but Paradigm considers them part of the S8's design, so I decided to leave them on. What I ended up with is firing the speakers so their output summed at my listening position, which meant pointing them directly at my seat. This worked perfectly, the speakers conveying high frequencies in a very complete, natural way. The effort required to set up the S8s pays big dividends, creating a soundstage that's almost wall-to-wall (my room is 20'W x 29'L) and a tonal balance that's seductive. Nobody will accuse the S8s of sounding tipped up, grainy or harsh. Their sound is sweetly detailed. They convey transient snap and spatial cues as well as any speakers I've heard, yet they are also full and pleasing. I quickly came to discover that the S8's G-PAL tweeter is something special, not because its performance resembles that of a ribbon, which many consider the standard for high-frequency reproduction, but because it sounds, to my ears, like a cross between the best fabric-dome and aluminum-dome tweeters I've heard. It easily communicates the steely presence of electric guitar, the splashiness of cymbal crashes, and the air and ambience of well-made recordings, always sounding pure and delicate in the process, sometimes making the treble of other speakers sound coarse by comparison. No format shows this off better than SACD, and some of the best-sounding SACDs I've heard are from three lesser-known labels: Fidelio Audio, Songlines and Opus 3. What sets these purist recordings apart is their upper frequencies, which have seemingly limitless extension and shading. The S8s portray the acoustic guitar, cymbals and gong strikes on the Marc Vallée Trio's Hamadryade [Fidelio Audio FACD 010] with as good a mixture of subtlety and solidity as I've heard, all the while maintaining an elemental sweetness. The opening gong runs on "Lights of Barcelona" spread into the room like morning light -- slowly and completely. The S8s convey the metallic body and underlying resonance of each strike, always remaining composed and sure. The Signature S8s will have you pulling out music just to hear how they portray the upper frequencies, just as some speakers do with bass. The S8s sound good at low levels, in which case they don't infuse musical detail with their own noise or truncate low frequencies. However, they are at their very best when pushed, which you can do liberally. They don't have the murkiness of speakers voiced to sound perpetually inoffensive, and they lack any crusty metallic edge that will abrade your nerves after a few minutes of listening. Even though Paradigm specifies a minimum of 15 watts to drive the S8s, they sound their best with a healthy amount of neutral power behind them -- euphonic, low-powered tube amps need not apply. Of the amps I had here, the solid-state Simaudio W-6 monoblocks and Belles 150A Reference sounded very good, but I preferred the 225W OTL Atma-Sphere MA-2 Mk II.3 mono amps for, among the many things these remarkable amps do well, their midrange transparency, which made listening to vocals a treat. I loved hearing k.d. lang belt it out on Absolute Torch and Twang [Sire 25877-2], lang's breakthrough recording from 1989. Absolute Torch and Twang has a digital edginess that the S8s didn't gloss over but did soothe to a meaningful degree, making this collection of swinging country tunes all the more enjoyable. Lang's voice is one of those that draws full attention, and it was gorgeous over the S8s, urging me to turn it up, which I did with enthusiasm. The Signature S8's bass belies Paradigm's 41Hz specification -- it went lower than this in my large room, although it never equaled the low-end impact or dynamics of either Wilson Audio speaker. Its depth and dexterity were immediately obvious, and its weight lends a sense of bloom that is quickly irresistible. The Signature S8s do explosive justice to low-frequency workouts like Harry Connick's She [Columbia CK 64376] and Walter Becker's 11 Tracks of Whack [Giant 24579-2], but it shines with recordings like Medeski, Martin and Wood's groove-laden Shack-man [Gramavision GCD 79514], which uses acoustic and electric basses in inventive ways, not merely to set the rhythmic foundation of the music. The Signature S8s tracked the low frequencies on this disc and all others with great precision, and they convey the kind of texture (though not the depth and weight) that the Wilson Audio MAXX 2s do -- at a small fraction of the price. For truly full-range sound, a subwoofer to go along with the Signature S8s, perhaps Paradigm's own Signature Servo, would not be out of the question, but it's not a requirement. There's more -- the abundant inner detail that's never unduly highlighted, the dynamic prowess -- but nothing overshadows what is perhaps the Signature S8's greatest virtue: These speakers push you to transcend the act of listening to an audio system in order to enjoy the act of experiencing music. Yes, yes, I know. We reviewers write this sort of thing all the time to say, in effect, that we like a product very much. However, the sort of products that cause reviewers to chatter in such a way are often obscure, created by designers whose vision is singular and goes against the grain of sound engineering in one way or another. They sound different, which is easy to confuse with better, especially amidst so many good products. The Signature S8s are better, or as I say in my listening notes, "unforgettable." I would like to be able to tell you how the Signature S8 compares to Paradigm's Reference Studio 100 v.3, which Tim Shea reviewed and called "one of the greatest bargains in all of audio." Both speakers are three-way floorstanding designs and have similar driver complements (although the drivers themselves are different), but there is a greater-than-$3000 gap in price. Visually, the Studio 100 v.3 lacks the obvious beauty of the Signature S8, but that's as far as this comparison can go given that I didn't have the Studio 100 v.3s on hand for sonic examination. Drat. However, the speaker I did have here for direct comparison is no slouch. Last year we named the Thiel CS2.4 ($3900 per pair in standard finishes) a Reviewers' Choice and our Aesthetics & Sound award winner. While there are certainly speakers that will go lower than the CS2.4 (Thiel makes a few of these), there aren't many that match its sheer fidelity. I called the CS2.4 "a great loudspeaker, one of the very best I've heard regardless of price" when I reviewed it late last year. This applies to the Signature S8 as well, for a few of the same reasons and some that are different. Both speakers are faithful to the signal fed to them. The Paradigms sound a little more mellow than the CS2.4s, which in turn are more incisive, portraying the leading edge of notes, for example, with a touch more speed. The Thiels sound lighter overall, a function of their bass perhaps, which has no additive weight or warmth. In contrast, the Paradigm Signature S8s are sweeter yet just as extended in the treble, go lower in the bass and display greater weight and bloom, and sound more palpable in the midrange, though not quite as transparent. Image outlines with the Thiels are crisply drawn, while images from the Paradigms are more full and fleshy. When you hear both speakers, you'll know that you're in the presence of extraordinary sound -- albeit sound that is more different than alike. If I had to choose one speaker over the other, I would likely settle on the Paradigms for their greater ease, bass extension and bass weight. I also think they would be a better match for some of the tube amps I often review. But it would not be an easy choice to make, especially if subwoofers from both companies are considered. It has taken eight years of reviewing for me to hear a Paradigm speaker, and what a speaker it is. The Signature S8 has all of the hallmarks of solid engineering and portrays music in a way that's always pleasing, due to its airy and detailed high frequencies, weighty bass and palpable midrange -- among other things. The S8s are at home in a system with cost-no-object electronics, and yet their price doesn't approach that of other top-of-the-line offerings. I can't say with surety that the Signature S8 is the best speaker in the under-$10,000 price range, but my money would be on it, which raises the question of why anyone would pay more than the price of a pair of Signature S8s. I'll answer my own question: I've reviewed many speakers that cost several times the Signature S8s' price, and I've enjoyed a few of them more. In a world without these speakers, I'd call the Signature S8s my own. Price: $5400-$6000 USD per pair depending on finish.